Who wouldn’t want to know how life in Iran, the country between Iraq and Pakistan, is? 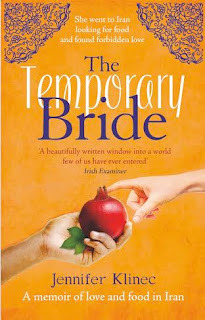 The Canadian Jennifer Klinec spent time in the country and wrote about her experiences in The Temporary Bride: A Memoir of Love and Food in Iran. “Jennifer Klinec abandons a corporate job to launch a cooking school from her London apartment and travels to countries most people are fearful of, in search of ancient recipes and delicious things to eat. When Jennifer Klinec, she is a bit of a serial-traveller (for her cooking school she went to places like Burma, Ethiopia and Yemen), talks about travelling you instantly want to go and see more of this world. The way she describes food makes you hungry. Her raw honesty feels overwhelming at times. Jennifer talks about things in a through and through humble way, she never sensationalizes her time in the Islamic republic. Jennifer learns from her hosts and respects their beliefs. She envy's their community spirit, and is elated when she is invited (and if only for the time being) to become part of it. At the same time the reader feels that she knows what she wants. Reading the book you learn that people in Iran are indeed open to dialogue with foreigners, and that they find ways to brave restrictions imposed on them. Jennifer’s story is a somehow bizarre one, but also so very ordinary, it could happen to literally everyone. On the very last pages, and up until the moment when tears roll down your cheeks, and not one moment sooner, you will read how her story ends. Finishing the book, you will have a strong desire to know what she is up to now. A sequel would be fantastic. Jennifer Klinec lives in London, England and was so very lovely to tell us about her hometown. THE TOURISTIN: Three words that characterize London? Jennifer Klinec: Loud, proud, ever-changing. THE TOURISTIN: How do you get around London? Jennifer Klinec: I walk everywhere. I'll even walk an hour each way to the cinema. It's good for my head and because London is always changing it's the best way to try and keep track of all the new places constantly cropping up. THE TOURISTIN: What is the best kept secret about London? Jennifer Klinec: The Finnish Church in Rotherhithe. It's a beautiful post-modern church that doubles as a cultural centre. They have a sauna you can book by the hour, a cafe serving cinnamon rolls, and a shop where you can buy liquorice and Finnish pine oil soap for cleaning the house. I try and go twice a month in the winter to have a sauna. THE TOURISTIN: What is your favourite borough/suburb/area in London and why? Jennifer Klinec: Bloomsbury. It's only 10 minutes’ walk from where I live and yet it feels a bit like a village. It's full of beautiful Georgian houses and has a long history of rebelling against convention. Even to this day it has almost no chain stores - Lamb's Conduit Street is full of independent stores, everything from bicycle shops to a bookshop publishing only books by mid-20th century women authors. THE TOURISTIN: The best place for a coffee or hot chocolate in London? Jennifer Klinec: I love The Espresso Room on Great Ormond Street. It's tiny - not much bigger than a broom closet but the staff make wonderful coffee and tea and have none of the attitude you get in some of London's other barista coffee places. And at exactly 3:30pm every afternoon the benches outside get the full afternoon sun. I call it my London beach. THE TOURISTIN: What is one restaurant we must try out while in London? Jennifer Klinec: The Baozi Inn in Chinatown which serves unapologetically authentic Chinese soups, dumplings and cold dishes like ginger-juice spinach. The prices are extremely reasonable and for most people it's a huge awakening to how good proper Chinese food can be. They do a sour and hot pigs intestine soup that I eat regularly and I haven't caught the flu since! Jennifer Klinec: If the weather was nice, I'd probably be on the Ridgeway. It's an ancient footpath that people used to use to drive their livestock to the market and I like to walk it in 30 kilometre stretches on the weekends. You can take the bus heading towards Oxford and the driver will let you off halfway, basically dumping you at a junction of the motorway. From there it's only a 10 minute walk to join the Ridgeway where you'll find yourself in woodland or barley fields. It's magical and only 45 mins from Central London. In bad weather I'd be watching a film at one of the Curzon Cinemas. THE TOURISTIN: Do you have a favourite museum/gallery we all have to visit when in London? Jennifer Klinec: The Museum of London is always fascinating. They have really immersive exhibits where they'll recreate a London street from the 1850s or a restaurant from the 1700s and the detail is amazing - everything from the cooking vessels to the kind of paper and font used on menus. I always learn so much when I go there and appreciate the incredible journey London has been on as a city. Jennifer Klinec: a) I try to avoid supermarkets if I can. I love going to the London Farmers Market in Marylebone on Sundays. To Neal's Yard Dairy for bread, milk and cheese. And of course London has lots of little Turkish corner shops that don't look like much from the outside but inside will have great watermelon, cherries, herbs and vine tomatoes. b) For clothing I love Folk on Lambs Conduit Street. Their own-label clothing is really unique but wearable and in colours and materials that you don't see everywhere. They also buy in some nice labels like Humanoid and Sessun. I bought a pair of mustard-coloured linen trousers there recently and I just love them. I buy all my shoes from the Natural Shoe Store because they sell my favourite brand Trippen from Berlin. THE TOURISTIN: What souvenir shall we bring back from London? Jennifer Klinec: Alcohol! London is home to such a distillery and micro-brewery scene it would a shame not to pack a few bottles of beer or gin into your luggage. The Borough Wines shops carry a great range of artisan spirits, many made in London, as well as fill-it-yourself growlers with revolving beers on tap. THE TOURISTIN: Thank you so very much Jennifer. I wish you all the best of luck with the book and hope to meet you soon for coffee somewhere in the world, or in either Berlin or London. I read the paperback but you can also get the Kindle edtion. Please buy the book and let me know what you think. It will be published in USA in February 2017.